That can't be right. Trump said he would protect those programs without cutting them. And we all know he doesn't lie. Yeah...I'm waiting to see how Trump supporters will respond to this one. How does the math work? Yeah right...Cut taxes without reduction to expenditures and an eye on the deficit. And Trump choose to focus on social services to be on the chopping block while funding his wall and increase in military spending. Just like the libs predicted. Trumpet's promises are as worthless as his credit rating. Just ask his ex wives, business partners and tenants. He gave the Pentagon more than they requested. Yeah, no political/economic influence from the MI Complex. Obama expanded overtime pay to 4 million workers. Now Trump is scaling that back. Here are the winners and losers from Trump’s watered-down version of the overtime rule. 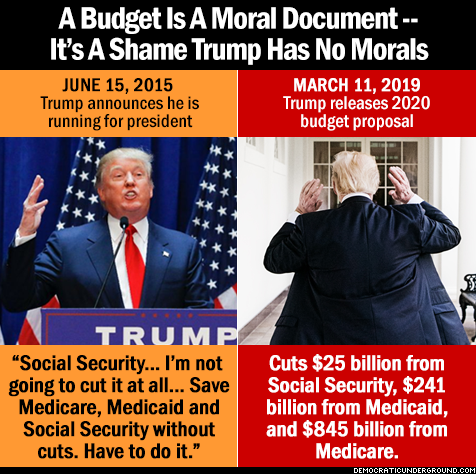 Lying Donnie: A promise made; A promise broken.